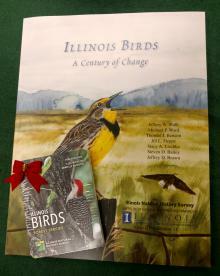 A terrific gift for anyone wanting to learn more about Illinois birds, their habits and more. Illinois Birds A Century of Change is a compilation of 100 years of data, photographs, and research. The unique span of time and geographic scale are this study’s strengths. In Illinois, where land cover and land use have changed dramatically owing to agricultural practices and development, insights into the dynamics of bird communities and populations over a diverse suite of habitats are crucial to understanding the past, present, and future sustainability of the avifauna across Illinois and the Midwest. This book summarizes the results of surveys conducted across three time periods. The findings are directed to a broad audience under four major headings: The Changing Illinois Landscape, Bird Communities through Time, Species Accounts and Looking Back, Moving Forward. The Birds of Illinois: Forest Species Card Set is a set of 32 water proof cards with color photos, range maps, and concise descriptions of 30 forest bird species in Illinois. Each card contains natural history information, description of song, and a life-size illustration of the egg. Authors: Heske, E.J., J.R. Herkert, K.D. Blodgett, A.M. Lemke, Eds. Preface: Healthy, self-sustaining river systems provide important ecological and societal goods and services upon which human life depends (Postel and Richter 2003). Concern over sustaining these services has stimulated major restoration efforts, and river and stream restoration has now become a world-wild phenomenon (Palmer et al. 2005). Despite the increased emphasis placed on river restoration, few projects are ever evaluated to assess their performance (Alexander and Allan 2006). There is a clear need to undertake meaningful monitoring of river restoration projects, not only to provide information on the effectiveness of the restorations themselves in ecological terms, but also to provide much needed data to help establish further the science of restoration (Giller 2005). Ecological success in a restoration project cannot be assessed in the absence of clear project objectives from the start and subsequent evaluation of their achievement (Dahm et al. 1995). The goal of the Spunky Bottoms restoration project is “to restore native plant and animal communities that were characteristic of the Illinois River floodplain and to reconnect the river to the floodplain to allow movement of aquatic organisms” (Blodgett et al., this volume). The research presented in this volume provides an overview of the baseline data that were collected at The Conservancy’s Spunky Bottoms restoration project between 1998-2003. These data are intended to form the foundation of our efforts to evaluate progress toward our restoration goal. Part 1 of these proceedings, provides an introduction to the restoration project at Spunky Bottoms. It begins with a paper by K. Douglas Blodgett et al. that describes the background and initial goals and restoration plans for The Nature Conservancy’s floodplain restoration project at Spunky Botts. The introduction section also includes a paper by Edwin R. Hajic that explores the interrelationships among Illinois River Valley wetlands, adjacent landforms, and the geomorphic processes that shaped these areas. Part 2 provides initial data from research on the aquatic systems of the site. This section includes papers that summarize research on the initial microbial communities (Tim Kelly), nitrogen and bacterial dynamics (Michael J. Lemke et al. ), insect emergence patterns (A. Maria Lemke et al. ), composition of the dragonfly and damselfly (Odonate) temporal patterns (Robert Novak), and development of the fish at the site are presented in Part 3, beginning with a study by Deborah Beal that provides some data on early changes in wetland plant species composition at the site. William Sluis then evaluates transplant survival of cordgrass and lake sedge. Four papers on vertebrates conclude the terrestrial systems section including preliminary surveys of reptiles and amphibians (John K. Tucker and Chris Phillips), small mammals (Edward J. Heske et al. ), wetland birds (Tharran Hobson et al. ), and waterfowl populations (Michelle M. Horath and Stephen P. Havera) at the site. As the restoration of Spunky Bottoms continues, we will continue to monitor and evaluate progress towards our goal of restoring a dynamic and diverse floodplain community at the site in the hopes that the lessons learned at Spunky Bottoms can inform other large river restoration projects around the workl." Crayfishes, also known as crawfish, crawdads, or mudbugs, are a diverse and important component of freshwater aquatic and semi-aquatic ecosystems around the world. Their familiar form is recognizable by almost anyone who has spent time in and around lakes or creeks. Crayfishes are found natively on every continent except Africa and Antarctica and occur in almost every type of aquatic and semi-aquatic habitat. This book intends to provide an up-to-date list of known crayfish species from the state of Kentucky. Distribution maps, illustrations, photos, and a key are provided to assist those interested in identifying Kentucky crayfishes. Information on the habitat and biology of each species is also provided, as is a summary of the historical efforts of crayfish biologists, or astacologists, in the state. The Crayfishes of Kentucky-intends to provide an up-to-date list of known crayfish species from the state of Kentucky. Distribution maps, illustrations, photos, and a key are provided to assist those interested in identifying Kentucky crayfishes. Information on the habitat and biology of each species is also provided, as is a summary of the historical efforts of crayfish biologists, or astacologists, in the state. Authors: Christopher A. Taylor and Guenter A. Schuster, 2004, 219 p.
The Field Guide to Crayfishes of the Midwest is the most up to date reference available for the identification of crayfishes found in aquatic habitats across the Midwestern states of Minnesota, Wisconsin, Iowa, northern Missouri, Illinois, Indiana, Michigan and Ohio. Authors: Taylor, Christopher A., Schuster, Guenter A., Wylie, Dan B., 2015, 164 pp. The wetland assessment procedure in this publication describes eight general wetland attributes that can be used to evaluate the functional success of constructed wetlands. Six of these (wetland status, functional problems, realism, floristic quality, size, and landscape setting) should be assessed at every constructed wetland. The two remaining attributes (wetland type and water quality improvement) can be used in situations where the wetland is expected to fulfill specific requirements. Introduction: The Illinois Breeding Bird Atlas presents a comprehensive summary of information about birds that currently breed in the state, based primarily on data from the Illinois Breeding Bird Atlas Project and the North American Breeding Bird Survey, as well as the knowledge gained over many years of experience with the state’s avifauna. As the word “atlas” implies, the book includes maps that illustrate the distribution of breeding bird species in Illinois, but it also includes information on their ranges, abundance, habitats, life histories, historical status, and recent population trends. There are almost 4,400 species of chewing lice in the world, the majority of which are found on birds. Each group of birds or mammals plays host to specific chewing lice, making lice ideal for helping determine the phylogenetic relationships of birds. This volume contains a key, broken down by host order, allowing ornithologists and bird lovers to quickly narrow down which group of lice might be present on a given bird. Beautifully detailed scientific illustrations of the more than 250 genera of chewing lice and lists of known hosts for each species provides the reader with a glimpse into this fascinating group. This book may be of interest to ornithologists, evolutionary biologists and of courses parasitologists. Preface: This work evolved from a discussion between the two senior authors during the 1984 national meeting of the Entomological Society of America in San Antonio, Texas. It was intended as an update of “A Check List of the Genera & Species of Mallophaga” published by G. H. E. Hopkins and Theresa Clay in 1952 and its two supplements published in 1953 and 1955. This was to be augmented by a full list of the known chewing louse-host associations. Subsequently, family and genus keys, along with genus illustrations, were added and, through the collaboration of Kevin P. Johnson and Dale H. Clayton, a section on chewing louse biology, ecology, and evolution was included, all of these expanding the scope and coverage of this work well beyond that of a simple checklist. Executive Summary (abbreviated): More than half of the wetlands in the conterminous United States have been destroyed, and Illinois has lost about 90% of its wetlands. In a effort to slow further loss, wetlands were protected under the federal Clean Water Act. However, the 2001 United States Supreme Court decision in Solid Waste Agency of Northern Cook County v. United States Army Corps of Engineers ruled that federal protection under the Clean Water Act does not extend to “non-navigable, isolated, intrastate” wetlands. This action has left a large but undetermined number of isolated wetlands without this protection. This report summarizes the functions of isolated wetlands and estimates the number and extent of isolated wetlands in Illinois. Authors: Szafoni, R.E., C.A. Phillips, S.R. Ballard, R.A. Brandon, and G. Kruse, 2002, 26 p.
This guide provides a brief overview of the amphibians of Illinois, including aspects of their life histories and distributions. This background information is important in helping you assess an area and determine appropriate habitat enhancement and management practices. In addition you will find guidance for resource managers, planners, restorationists, and private landowners in Illinois who wish to create, enhance, and manage habitat for amphibians. Regardless of the habitats available on your land, the management guidelines can make your area more suitable for amphibians. The Amphibians of Illinois Card Set is a set of 32 water resistant cards with color photos, range maps, and concise descriptions of the amphibian species most likely to be encountered in Illinois. The purpose of this guide is twofold. First the guide provides a brief overview of the amphibians of Illinois, including aspects of their life histories and distributions. This background information is important in helping you assess an area and determine appropriate habitat enhancement and management practices. In particular, it is useful to become familiar with the amphibians that may be present in your part of the state. This information can help focus management efforts on local species. In the second part of the guide, we provide technical guidance to resource managers, planners, restorationists, and private landowners in Illinois who wish to create, enhance, and manage habitat for amphibians. Regardless of the habitats available on your land, the management guidelines can make your area more suitable for amphibians. Regularly $45.00 - On Sale - $25! A comprehensive source on the status, management, and biology of Illinois waterfowl. A variety of topics relating to waterfowl were investigated and are discussed in this 628-page book with major emphasis placed on wetland habitats, food habits analyses, populations analyses, banding results, harvest information, historical records and regulations, private duck clubs, Canada Geese, nesting information, and waterfowl management. This book captures the strong traditions of waterfowling in the heart of the Mississippi Flyway and will be a welcome addition to the literature for those with a special interest in waterfowl. Illustrations, tables and color photos in this remarkable collection document a century of waterfowl investigations. This document provides the scientific community with basic biological information on the round goby, which entered North America in 1990. We reviewed the available European and North American literature and compiled a comprehensive bibliography of round goby references including abstracts and annotations. We have also included a listing of examples of outreach materials available on the round goby. This document was inspired by the Round Goby Conference held in Chicago in 1996. Many of the data presented at the conference were preliminary, and therefore were not incorporated into this text. However, we have included the conference abstracts as an appendix. Summaries of conference discussions on research and outreach are also included. This guide is intended to improve the quality and success of restored and created wetlands. It emphasizes the overall restoration and creation processes and presents information that serves as the basis for making decisions for completing each stage of a wetland project. Our guidebook was written primarily for wetland managers in Illinois, and therefore, is somewhat technical in nature. Users who will benefit most from this guide are those who have a background in botany, biology, hydrology, pedology, civil engineering, or landscape architecture. The most successful restoration and creation efforts will be accomplished by interdisciplinary teams that include specialists in these fields. The background material for teachers and the student activities that make up this publication were designed to help young scientists become aware of what biological control is and how it can be used to help manage various types of pest organisms that plague humanity. Pests Have Enemies Too is not a curriculum; rather, it is a sequence of activities designed to give students a broad overview of biological control. The concepts presented in these materials are based on sound scientific research and should provide students with the necessary information about this very important topic so that they may make informed decisions about pest control and pest management in the future. Activities are designed for grades 5-10. This publication provides a basic overview of wetlands legislation. The information is meant to be brief, concise, and as unbiased as possible. Legislative programs with the greatest potential to affect wetland protection within Illinois were chosen based upon the responses of 38 resources professionals. These experts responded to a wetlands legislative questionnaire distributed in 1993. They were asked to rank the effectiveness of wetlands programs. Based upon their responses, 29 programs were included in this document. The document is divided into three sections: 1) Federal Legislation and Programs; 2) State of Illinois Legislation and Programs; and 3) Local Legislation and Programs. Private programs are not included. Recognition of the functions and values of wetlands have spawned efforts to stop or reverse wetland loss. Management of wetland resources requires a knowledge of the location, extent, and character of our remaining wetlands. The Illinois Wetlands Inventory (IWI) is an enhanced version of the USFWS National Wetlands Inventory of the 1980s, which located and classified all surface water in the nation. This publication is intended to serve as a reference for resource planners, managers, environmental scientists, policy makers, and other interested in wetland resources in Illinois. It provides valuable baseline data for future analyses. Introduction (abbreviated): The Illinois Council on Forestry Development, formerly the Illinois Commission on Forestry Development, was created by the Forestry Development Act of 1983. Although the Act included a number of specific charges, its general objective was to provide for an evaluation of the forest resources and forest industry of Illinois. Of particular importance to the Forest Resource Analysis Committee of the Council was its mandate to "determine the magnitude, nature, and extent of the State's forestry resources." This book summarizes the Committee's evaluation of the forest resources of Illinois. Introduction (abbreviated): Illinois is fortunate to have a large number of biologists associated with its universities, colleges, museums, botanical and zoological gardens, private companies, and government agencies. This directory provides a centralized list of the systematists, ecologists, and field biologists who live or conduct research in Illinois. While a number of professional societies have membership lists, there has been no single source that gives the addresses, phone numbers, and areas of expertise for this group in the state. Provides teaching materials for science teachers to use to foster an understanding of all aspects of insect control. The 50+ activities included provide science teachers with an exceptional resource to use in teaching the relationships between science, technology, and society. Some topics include: Food Webs, Insect Awareness, Biogeography, Taxonomy, Insect Development and Control of Insects. These activities were written for grades 5-10, but some might be adaptable to other age groups. Introduction (abbreviated): Entomologists engaged in taxonomic research require an in-depth knowledge of the literature on the group in question. The ever increasing volume of papers, coupled with the need to know the historical literature on which the taxonomy is based, presents a major hurdle. For many groups of insects this problem has been addressed, in part through the compilation of detailed catalogs. This is not the case for aphids, and there are no catalogs to the extensive taxonomic literature on this important group. The information in this catalog is presented in three sections. The first lists the species along with extensive annotations; the second contains over 200 references related to those species; and the third records the hosts of Cinara for which documentation can be provided. This paper reports the faunal, phonological, and host plant data associated with a collection of about 30,000 microlepidoptera representing 954 species. Collected by the late Murray O. Glenn between 1927 and 1976 in Marshall and Putnam counties, Illinois, and donated to the Illinois Natural History Survey in 1977, this collection may represent the most complete and significant assemblage of midwestern microlepidoptera in existence(Godfrey 1978). It is rivaled perhaps only by that of the late Annette F. Braun, Cincinnati, Ohio, a collection that now resides in The Academy of Natural Sciences of Philadelphia, Pennsylvania (R.W. Hodges, pers. comm. ), except for a synoptic set of specimens given to the University of Louisville (C.V. Covell, Jr., pers. comm.). A substantial amount of Glenn material is also preserved in the United States National Museum of Natural History at the Smithsonian Institution. Glenn's persistent collecting activities, coupled with his careful labeling and preparation techniques, resulted in valuable data that have application to current and future ecological and systematic research and to inventorying natural resources of Illinois. This information, therefore, is made available here to aid investigators in these and related disciplines. The identification and treatment of chemical degradation by most existing water treatment programs has been dominated by engineering technology. The lack of tools for direct biological assessments of water resources has minimized participation of aquatic biologists. A major purpose of this publication is to provide a methodology for biologists to assume roles in monitoring, evaluating, and managing water resources. The method proposed herein provides a conceptual framework for biological monitoring, and it describes a useful tool to accomplish this goal-the Index of Biotic Integrity (IBI). The strength of the IBI is its ability to integrate information from individual, population, community, zoogeographic, and ecosystem levels into a single ecologically based index of the quality of a water resource. Abstract (abbreviated): Waterfowl die from ingesting lead shotgun pellets deposited in the bottoms of lakes and marshes and in fields. In most instances, they die after ingesting 1 or 2 pellets, their bodies wasting away over a period of several weeks, losing from 30 to 50 percent of normal weight. No other disease produces such a consistent chronic weight loss. Less frequently, a large number of shot are ingested, an acute form of lead poisoning results, and the bird dies in good weight. More definitive diagnoses of lead toxicosis have been made from levels of lead in wing bones, in blood, and in the liver and other organs. This publication highlights a seminal workshop on landscape ecology, which focuses on spatially heterogeneous geographic areas. Such areas can include pine barrens, regions of row crop agriculture, Mediterranean woodlands, and areas of urban and suburban elements, including human actions as responses to, and their reciprocal influences on, ecological processes. Principles of landscape ecology presented in this publication provide theoretical and empirical foundations for a variety of disciplines such as regional planning, landscape architecture, and natural resources management. Foreword (abbreviated): The words ecology, ecosystems, renewable resources, and pollution loom large in our vocabulary and concerns today. The studies described in the book encompass these concerns as the authors trace an array of twelve elements -principally minerals- from their geographical sources to incorporation in the keratin of the primary feathers of goose wings. Doctors Hanson and Jones determined that the quantitative pattern of minerals found in feather keratin can be employed usefully in determining the birthplaces of wild geese and, in their subsequent years of life, their molting or breeding areas, or both. This is possible because each nesting area appears to be unique with respect to its local geology or to the input of minerals it has received over thousands of years from adjacent areas from wind deposits, the action of glaciers, rivers, and streams, its contact with the oceans, or a combination of these factors. Thus, the patterns of minerals incorporated into the feathers reflect in varying degrees the nutrient chain that can be traced back through the plants to the soils and, ultimately, to their rock origins.